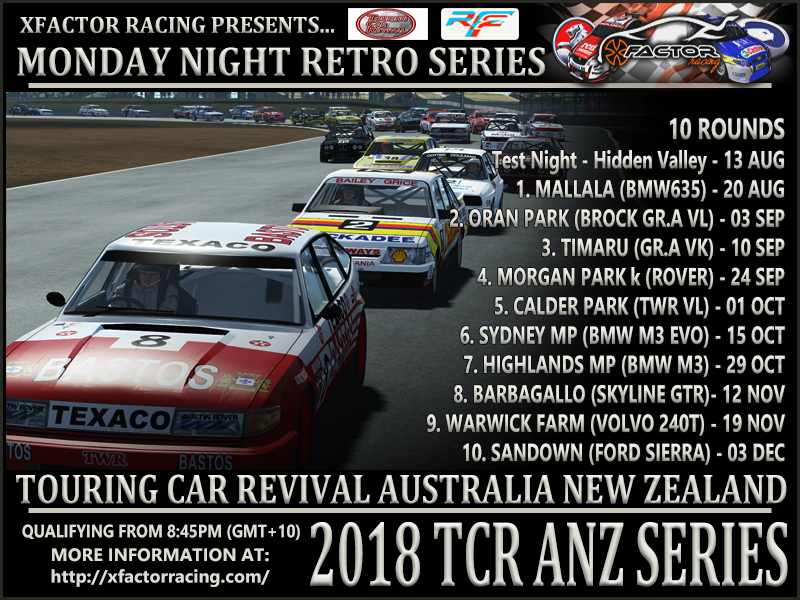 Here is a great guide on the Sim Racing Code. a) Out-Lap/In-Lap. A driver on his out-lap or in-lap, (i.e. a lap that will not count for a time on the starting grid), should always allow other drivers to pass without incurring upon the faster car any delay whatsoever. An out-lap should have the driver staring intently in his/her mirrors for the approach of any car involved in a hot-lap. a) In sims with rolling starts, drivers are to keep a tight grid until the green flag drops. Slowing down to get greater accelerating zone prior to the start will not be tolerated. any passing attempts. In real-world racing, if the trailing driver manages to get side by side and has the inside line into the following corner, then the passing driver normally has the right to pass. In Sim racing, however, things are a little more complicated. b) To ensure an absolute minimum of collisions, drivers are expected not to complete their passing attempt unless they are clearly in front at the turn in point. In sims that have a spotter warning about the positions of other cars, a greater responsibility lies on the driver being passed. Nevertheless: The trailing driver must take into account that lag may cause the other drivers spotter to react too late. Hence, the trailing driver must make sure that his opponents spotter has spotted him before completing the passing attempt. As in real-world racing, passing isn’t always possible. If a faster driver is slowed behind another driver that hasn’t been lapped, and cannot find a safe way to overtake, then the onus is on the faster driver to remain behind the slower driver until s/he can construct a clean passing move. Patience is needed, while desperation, however understandable, should never be a factor. c) Passing outside the track or on the apron is not allowed. A driver gaining positions by such moves should let those who got passed immediately regain their position. A driver failing to do so will be penalized. a) Blocking. When battling for position, a passing opportunity will almost always evolve. The driver in front is allowed to alter his line once. If the drivers are side by side, a line change is not advisable. b) Lapping. A driver being lapped should get off the racing line immediately, and allow the lapping driver to pass without incurring any time-delay. Slowing the faster car in a lapping situation is highly frowned upon, and slowing the faster car for more than three turns will, in all likelihood, result in some penalty for the infracting driver. c) Getting Lapped. Do not slow down in the race line, especially in an accelerating zone such as the exit to a turn. Do move off-line, on a straight, or at the exit of a turn. d) Faster Cars: The faster car is expected to wait until the lapped car clearly moves off-line. Impatience will result in pointless shunts. Taking out the opponent should be avoided at all costs. a) Out-Braking: If a driver realizes that he cannot brake sufficiently to avoid contact with the driver in front, the late-breaking driver is supposed to steer away from any impact, even if this means a high risk of ruining his/her own race with an ‘off’. The alternative would be to risk ruining both one’s own race, as well as that of the opponent. A driver experiencing mechanical problems, either simulator based on PC Hardware based, should get off the racing line immediately. Flags are to be respected at all times. a) Yellow: Lift off in yellow flag zones. No passing is allowed in yellow flag zones. Yellow Flags mean that there is a spin: it does not mean accelerate as hard as possible into the shunt. 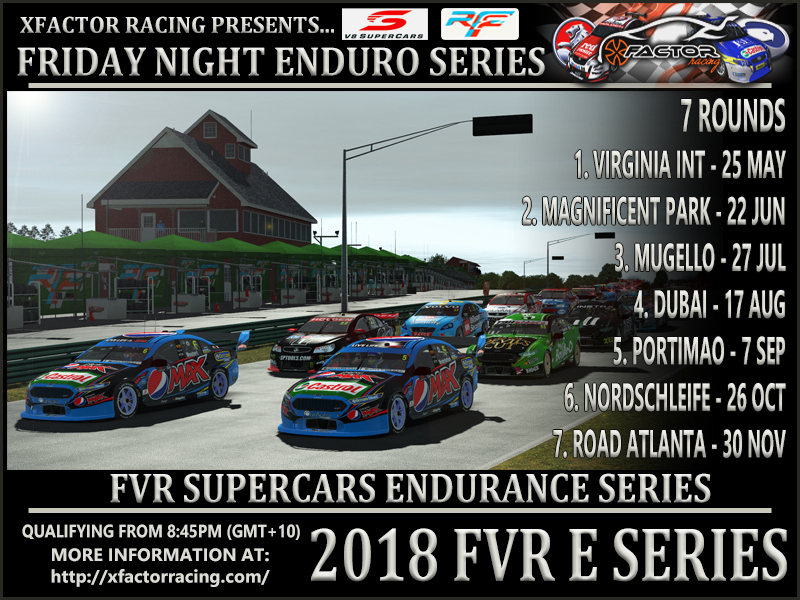 XFactor would like to promote fairness and fairplay in sim-racing. Needless to say, XFactor acknowledges the freedom of speech, but nonetheless encourages drivers not to chat during race or qualifying sessions. “Criticize a friend in private and praise him in public.” L. Da Vinci. XFactor strongly recommends that drivers respect general rules of politeness. Bad-mouthing other persons in public may - in extreme cases - lead to a reaction from XFactor RSC. Drivers should act as if they actually could get hurt. This should explicitly be reflected upon in the rules of leagues wishing to be a member of XFactor. 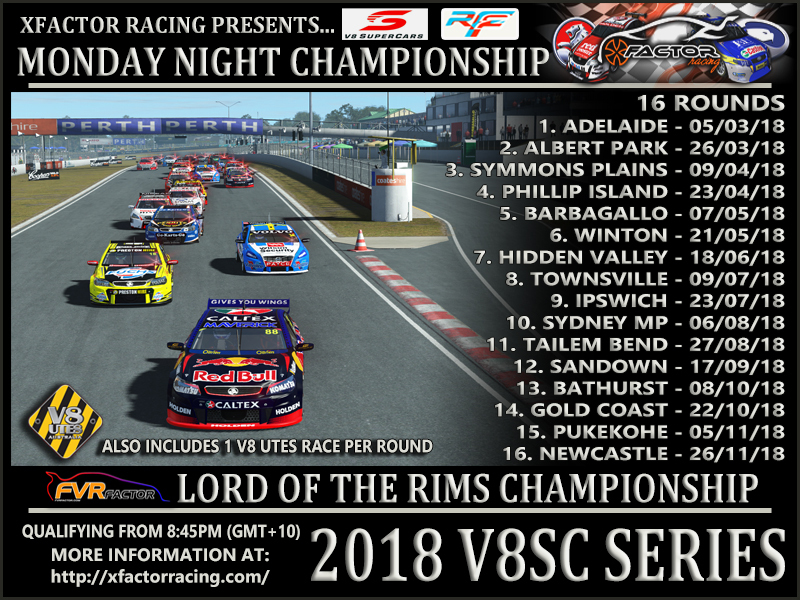 Championship Racing sets the standard upon which all sim-racers should aspire, and the quality of racing in leagues within XFactor can only have a positive result in the arena of pick-up races. II. Differences from real life racing There are several differences between real-world racing and Sim-racing. This section describes some of the differences, and it’s implications for on-track Driver Behavior. 1. Behavior: On track conduct that is perfectly safe and legitimate in real-world racing may not always be so in Sim-racing. These differences are explained herewith. a) Internet Lag: Due to internet lag, the positions of the virtual-cars on the track may differ significantly from what the driver actually sees. While Racing simulators do have prediction models that take this lag into account, these prediction models can and frequently are erroneous, in particular when cars are turning, braking or accelerating hard. When following another car at 290 km/h (180 mph) at one car length’s distance, the relative time-gap between the cars is 0.05 seconds. A slight rise in lag for either one of the drivers involved which is not sufficiently compensated for by the prediction model may, and frequently does, result in warp contact. b) Warp contact: The simulator interprets the position of the cars as ‘in conflict’ with each other, i.e., contact, even though the drivers themselves haven‘t visually touched. Sim racing is, of course, at its best and most entertaining when crashes do not occur. Hence, the drivers are encouraged to keep a safe distance. There is, furthermore, no need to chase another car too closely at sections of the track that do not facilitate passing. By remaining too close, the risks of warp contact increases significantly, and far outweigh any advantage gained from tailgating. 2. Peripheral vision. In real-world racing, humans can detect movements almost 90 degrees to the side without needing to turn their heads. By turning their heads, they can perceive a 360. degree arc. In Sim racing, peripheral vision is very restricted, and remains at the mercy of the Simulator. Although a simulator may have a look left/look-right/look and rear-view option, these cannot fully compensate for the real world turning of heads. Again, due to internet lag, the positions of the cars may differ greatly from what the driver actually ‘sees’. Hence, even though looking left and right may suggest that there are no cars ‘visible’, there still remains the possibility that a car actually is present. a) Outside View. Drivers using ‘outside view’ do not have a problem with restricted peripheral vision. Therefore, they may not realize that they are not be visible to the car in front. Drivers using outside view should act as if the driver in front is using inside view, i.e. being aware of restricted peripheral vision and the blind spots. b) Mirrors. In real-world racing and Sim-racing, mirrors do not always show the absolute truth. Even though it may appear as if there are no cars in the mirrors, there may indeed be a car behind, hovering within the mirror’s dead spot. Drivers are encouraged not to remain in the blind spots of the driver in front longer than absolutely necessary. Solution: Try to determine the position of other cars by listening. Use look left/look right facility, as well as mirrors. a) Bandwidth Limitation. Due to bandwidth limitation, a simulator may restrict the number of cars visible, both in front and in the mirrors. Hence, even though the road looks clear, there may be cars already involved in an accident further ahead. Or, there may be a car already on the piece of tarmac that appears perfectly clear to the driver. b) A start-crash frequently results in far more severe situations than any other incidents. Mass accidents are generally the result. Solution: Drivers are especially encouraged not to take any risks on the starting grid or the critical moments after the flag drops.Generally, penalties are very severe for this type of transgression.